SJPII looks forward to welcoming L.M. Falcone, former children’s television writer and award-winning author of middle-grade spooky fiction and detective mysteries for Grades 1 – 4. I Didn’t Stand Up. 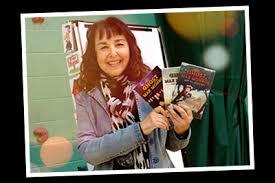 Her presentation is intended to inspire young writers and will include tips on creating interesting characters and problems and composing puzzling mysteries. Some copies of her books will be available for purchase on the day on the visit. More details will be available shortly. Previous Story Previous post: SJPII Earth News!! !